Take an adventure into the wilderness of Bangkok on a visit to the inner city of oasis of Bang Kra Jao. Best reached by boat, this island is often referred to as the "green lung" of Bangkok and incredibly, has been left untouched by city developers. Journey back in time as your cross the river to a paradise of lush tropical vegetation and a slower, more traditional pace of life. Ride through local communities, pass villages and listen to the sounds of children playing. If it weren't for the city skyline, you would never believe you're still within Bangkok city limits! Discover tropical fruits and flowers along the way as the trail leads to an ancient temple. The peeled-off paint revealing the underlying bricks confesses the age of the temple, built many hundreds of years ago. The total ride is about 20 kilometers starting with a short section in the city before crossing the river. From there it's a combination of minor roads and elevated pathways, through temple gardens and tropical jungle with no hills. The elevated canal pathways may not be suitable for those afraid of heights, but we think these add to the adventure! We meet at the back parking lot of Suan Plearn Market on Rama IV Road. If taking the BTS you need to get off at Phromphong station, use exit 4 and walk straight to Sukhumvit Soi 26. Here you can take a motorcycle taxi or a regular taxi to Suan Plearn Market, distance is 2.6 km and it takes only 10 minutes traveling. We don't recommend walking. For a meeting point map - click here. For a google map click here. My cycling trip was excellent and the guide superb. Highly recommended! I booked the tour that starts at 13:00. I was the only one at this tour and therefore I had a private tour with Guide Woody and it was AMAZING!!! It lasted around 4-5 hours, where we started cycling from the office of the company, passing around 10 minutes in one of the main busy roads of Bangkok, then arriving at the pier, taking a boat to the other side of the river, where the jungle is. Then riding there the whole time. Woody was extremely nice, went out of his way to take good care of me while cycling and also, took me to places where only locals go (for example, there is a market on the weekend that only locals go there). We ate a late lunch in the market and explored it a bit. The jungle is stunning, it's quiet and the air is clean. I highly recommend it for those who wants a getaway from the busy city and for some excitement and a once in a lifetime experience. Ask for Woody, he is the best guide! Thank you Woody, for sure I will come back! Staff was very helpful and professional helping to plan the right trip for us. Good communication with the staff all through the planing. Great tour with a combination of biking and visiting local sites not crowded by other tourists. Tour Meets08:15 for a 08:30 departure and 12:45 for a 13:00 departure, at Suan Plearn Market on Rama IV Road. Closest BTS is Phromphong. Tour EndsAround 11:30 for the morning tour and 16:30 for the afternoon tour at meeting point. Just across the Chao Phraya River, a short hop from busy Bangkok, is an extraordinary place known to the locals as Bang Kra Jao. This amazing wilderness in Bangkok can best be reached by boat and incredibly it has been left untouched by developers. Crossing the river is like taking a journey back in time. You will find a peaceful place with lush vegetation, a maze of waterways, small villages, temples and real tropical jungle. If it wasn't for Bangkok's skyline, you would never believe you were so close to the city. And, there is very little traffic! 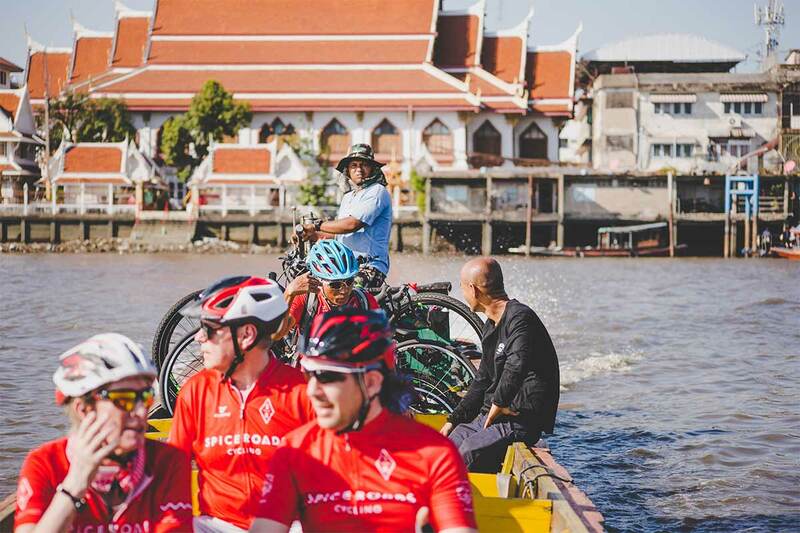 We ride through the local communities passing villages, schools and temples (there are over 30 temples in this area) and a delightful floating market (open on weekends only). On our journey we'll introduce you to the various flowers and fruits growing along the path and stop for refreshments on the river before we visit a fascinating temple built in the Ayutthaya period that is more than 250 years old and has a unique roof made of teak wood. We ride about 20 kilometres in total. At the beginning of the ride there is a short busy section in the city before we cross the river. We then ride along very minor roads, pathways, through alleys, temples, gardens and tropical jungle. There are no hills. Some of the canal paths are elevated and quite narrow and we advise caution on these sections. If you are terrified of heights or otherwise unstable while riding a bike you might want to reconsider before booking this tour. Otherwise, it is a nice and easy ride!